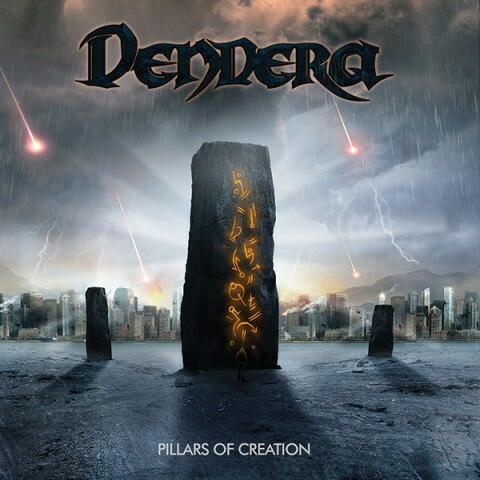 Dendera are a heavy metal outfit hailing from the South West of the UK, who have been producing their brand of caustic rock since their debut EP release in 2011. Two blistering albums followed; 2013’s awesome “The Killing Floor” and 2015’s quality follow up, “Pillars of Creation”. The band are no strangers to the live stage, indeed that is where their musical ability really shines; they have graced the same stages as rock royalty such as Saxon, UFO, Alestorm, Orange Goblin, Gloryhammer and Soulfly, to name but a few. “Blood Red Sky” is the first instalment in a two-part set of EP’s. The first track on the EP is “The Awakening”, which came as a bit of a surprise. Coming in at a mere one minute and forty four seconds, it is an instrumental bruiser which showcases some nice guitar work; it’s a solid introduction into what to expect for the rest of this five track offering. The first track proper, “Final Warning” begins at a wicked pace and Ashley jumps in feet first with his distinct vocals almost straight away. There are some sweet pinch harmonics hidden away in there and there is no let-up in energy all the way through. The instrumental bridge is followed by some first class technical drumming and a blistering guitar solo. It’s a shame when the track ends, really. Title track “Blood Red Sky” showcases more of the same, galloping along at breakneck speed. There are some mad vocals towards the end of this track and Ashley does have that knack of slipping into a range almost high enough to shatter crystal. The penultimate song comes in the form of the manic “Age of Agony”, with some thought provoking, anger inducing lyrics, ending abruptly with the dying crash of a defiant cymbal. All too soon, the last track comes around and “When All Is Lost” is a fitting end, a bruising chugfest of a song – almost eleven minutes long – that captures the essence of Dendera perfectly. I particularly like the way the action is taken down several notches halfway through, before ramping back up for a semi-dramatic finish. I believe that Dendera have passed into another league with this EP. “Blood Red Sky” is not only unique; it is a masterclass in tight musical ability and dedication to the craft from some very talented people. You can also hear the obvious progression for them as a band which has elevated them another notch on the ladder to rock glory, with a perfectly produced and formed record. The only thing I’m disappointed about is that this is only four tracks, if you discount the short intro piece. I wanted to hear more and I’m pretty sure with the form they appear to be in at present, Dendera could have produced a full length album, rather than releasing two EP’s at separate times. That’s not a criticism, just a desire to see more of what they can do. It’s been an eventful couple of months for Hampshire-based hard rock band, Dendera. They stepped up a stage from last year for a dark performance at Southampton Uni’s esteemed Takedown Festival in March; then they found themselves a man down as Tony Fuller, axe-man extraordinaire, left the band this month. However, one good thing to come out of 2015 despite Tony’s departure, was a new album, “Pillars of Creation”, which the outgoing guitarist featured on before he left. Anyone who may have written Dendera off as an Iron Maiden sound-a-like band can firmly shove their opinion where the sun doesn’t shine, for this new album is 100% Dendera – unique and heavy as hell. It’s clichéd to say a band have matured, but with this album, Dendera really have stepped things up a gear or two. Always cohesive as musicians, this is a tight, polished diamond of a record that will hopefully silence the critics once and for all. “Pillars of Creation” is only eight tracks long, however each song is loaded with killer riffs, sweet vocals and 100% pure musicianship. It’s clear that Dendera aren’t messing about with this record; they mean business and this could be the one that gets them the breakthrough that they deserve. First track ‘Claim Our Throne’ could be a tongue in cheek homage to the place they’re hoping to take on the rock scene with this album. Starting off with an intro that could have come straight from a Machine Head album, ‘Claim Our Throne’ is a bang up to date metal track that also screams overtones of more traditional metal … it’s a bruising, belter of a track. I particularly like the backing vocals, which bring a new dimension to Ashley’s voice. Second offering, ‘Bloodlust’ is brutal; a romp through some awesome guitar work with some dark vocals and superb drumming. It’s more recognisable as Dendera, in my humble opinion, but that makes it even more exciting to listen to because it shows how much they’ve evolved since ‘The Killing Floor’. Ever since I heard third track ‘In High Tide’ live back at the Joiners last year, I loved it. It chugs along with some classic Ashley vocals thrown in, but the riff reminds me vaguely of 80’s Megadeth. Anyway, it’s one of my favourite tracks and well worth repeated listening. ‘Disillusioned’ starts with a charming vocal, “Broken and bound by the pain that consumes you, eaten alive by the lies and deceit …”; you just know that this is going to be an epic track and it doesn’t disappoint. Almost melodic in places (oh, how we hate that word, right? ), this is a classic track with some awesome musical work. Track number five, ‘The Daylight Ending’ is an aural delight that will make your ears bleed if it’s turned up high enough and there is more of the same with ‘The Chosen One’, which will be a firm hit with the stoner rockers out there who prefer a slightly slower pace. Still epic, nonetheless. Final track, ‘Edge of Tomorrow’ ends the album exactly as it started. Explosive, with crashing, manic riffs, thoughtful lyrics and some serious changes of pace, it’s an epic track that quite rightly finishes off one of the best local band records I’ve heard for some time. With an album launch party planned for Thursday 18th June at the Garage in London, it’s clear that Dendera are fully prepared to come back stronger following Tony’s departure, and you better watch out if you’re not expecting them to melt your face off. If you miss this one, you truly will miss out. See you at the front!